I was walking around the shops in Atlanta when I spotted this on the shelves. It is one of those cheapo video games as opposed the the fancy smancy Playstation 2 or the X-Box. What tickled me was the name of the character, Battman. I doubt if it was a typo but more likely a way to escape infringement of copyrights. No prize for guessing that the toy was Made In Ch1na. Anyway, it got me thinking about this superhero. Almost all superheros have one kind of a weakness of another. Most famously would be the effect of Kryptonite on Superman. Or how the absence of water will render the likes of Aquaman, Man From Atlantis and Iceman useless. Or how heroes like Ultraman and Birdman needs the Sun to recharge their energy level. Or how Popeye cannot do anything without his can of Spinach. I guess in this particular case, Battman's weakness would be the constant running into "Low Batt". 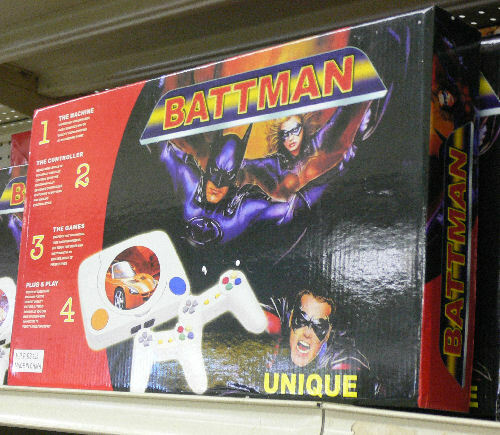 Battman: Hong Gan liao. HQ, I am in trouble. I need to bail out! HQ: What seemed to be the problem Battman? Battman: I kena Low Batt again. Last night neber charge properly and I forgot to bring out my spare battery! Sounds like my old Motorola A780 phone. When I first open the box fresh from the phone shop and I saw the spare battery included as a standard item, I knew this phone Hong Kan liao. Sold it after 3 months. chey! me thot you are buying xmas presents for yr son and godson. mihuatang: No lah... my kids still too young to be playing video games lah. I can feel the insult of my fav hero all the way down to my toes....Curse you, Ch1na pirates! Should be glad it's not "Buttman"! akk: I used to like Batman too until I realised that he is just an ordinary guy who happens to have a lot of money to buy expensive gadgets to get ahead. Just like the bad guy in The Incredibles. Lynne: If it's Buttman, I fear for Robin's safety. -_-"
maybe you are ready for another god-son? akk: Looks like we have different views wrt to superheros. Then again, I don't have a favourite superhero or at least one that I can remember. no lah becos you got so many gals/syt calling u daddy, papa etc, it's time to balance it with more god-sons mah! mihuatang: Frankly, I have no bladdy idea how this daddy/papa thing got stuck onto me. Any clues? maybe you are what they call "sweet-young-things-killer"
mihuatang: Har? Me SYT killer? Zhun bor? ?